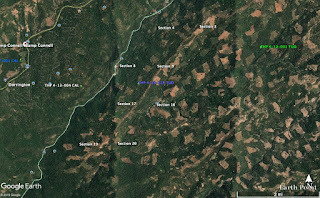 THPBlog: Sierra Pacific Industries to clearcut log trees up to 150 years old adjacent to Calaveras Big Trees State Park and Dorrington, CA. Sierra Pacific Industries to clearcut log trees up to 150 years old adjacent to Calaveras Big Trees State Park and Dorrington, CA. This THP is about 5 miles NE of Arnold, CA, 2 miles east of Dorrington, CA and Highway 4 by Calaveras Big Trees State Park (29 acres of Special Treatment Area (STA) fuel break prescription are proposed adjacent to Calaveras Big Trees State Park to hide the effects of clearcutting). Sierra Pacific Industries is planning a mostly clearcut tractor and cable logging operation on steep and unstable slopes in ponderosa pine, sugar pine, Douglas fir, incense cedar and white fir forests at an elevation of 3,000 to 5,800 feet. There are multiple unstable areas (debris slides, dormant slips, rotational slumps, headwall swales) including; an unstable area in Special Treatment Area 2, and 3 unstable areas (adjacent to fuel break 6, and alternative units 1046 and 1092. SPI is planning to use temporary roads, crossings and landings during the winter period, and use ground based equipment on existing skid trails in areas of high/extreme erosion hazard. They also are planning to use an existing skid trail between class II (mid sized) and class III (intermittent) watercourse areas within the fuel break, use a pair of skid trails within the edge of class II (mid sized) watercourse areas in units 2690 and 5817, and use a skid trail within the edge of a class III (intermittent) watercourse area in unit 1046. A northern goshawk was reported on forest service lands within 1 mile of the THP area in section 32, and there are 10 CA spotted owl nesting territories within 1.3 miles of the THP area. Threebract onion was found in unit 1092, and Coleman’s piperia was found in unit 2544.